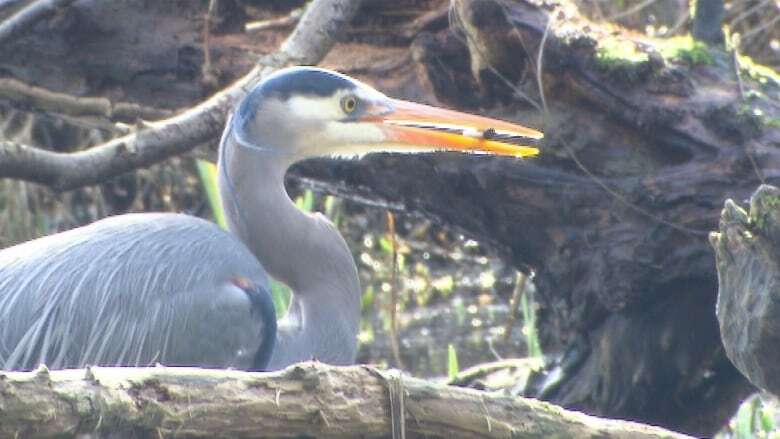 A new $4,900 camera at Stanley Park is broadcasting a live feed of the Vancouver park's heron population. Maria Egerton, the conservation projects manager with the Stanley Park Ecology Society, says the old camera was in standard definition and didn't provide many angles to view the park's popular Pacific great blue herons. The colony, which consists of about 300 herons, is home to around 100 active nests that produced 175 fledgling herons in 2015. It's located behind the park board offices in Stanley Park. "We have 13 different angles we can work with as well as zoomed-in and zoomed-out viewscapes where we can see the whole colony," said Egerton. She says the upgrade comes just in time to see "fun courtship behaviour" with the birds. "They do this beak-wrestling thing where they grab each other's beaks and pull back and forth and they squawk at each other and the males defend their nests," she said. "There's a lot of fun courtship behaviour to see"
A previous version of this story stated the cost of the camera was $3,000. In fact, the camera cost $4,900 and the Vancouver Park Board said the total cost of the project, including all infrastructure costs is $30,000.